Thanks to the wonderful Susan @ Between Naps On The Porch for hosting this really fun party. Be sure to check out all the participants. 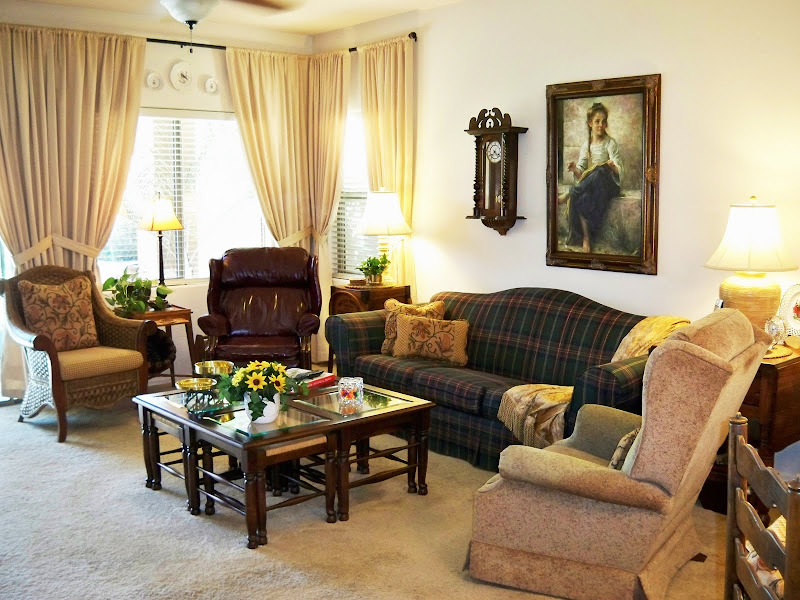 Our familyroom, breakfastroom and kitchen are all one open great room. The only downfall to this is the lack of wall space. This whole area is filled with windows and so there is only a small wall space above the sofa for art and one wall in the breakfast room for art. This one picture and clock have been displayed on the only wall space there is for several years. Time for a change. Last week I redid the breakfastroom wall and took the mirror down from there, so I decided to put it above the sofa. Since this is a long narrow space, the mirror helps to give the room some depth. It doesn't show in this picture, but the entertainment center is directly across from the sofa and now I can see the TV in the mirror from the kitchen. That's an added bonus while I'm cooking. 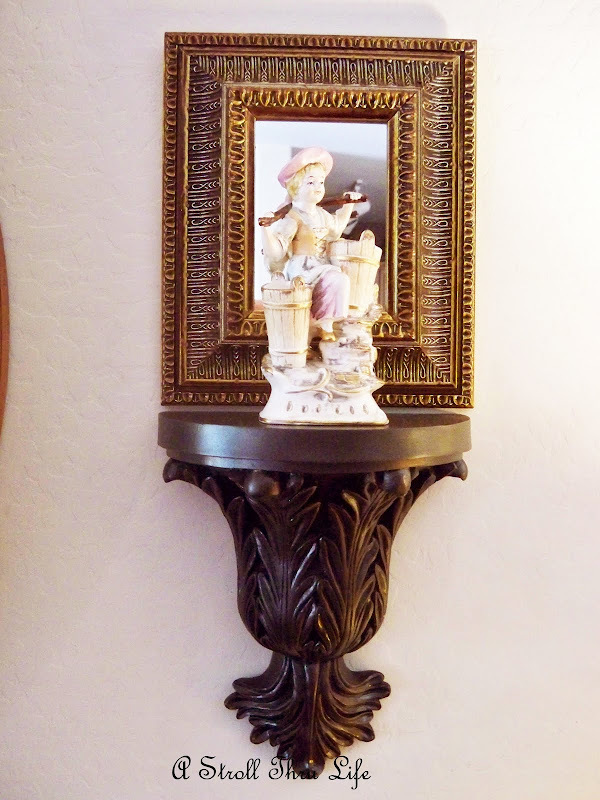 I spray painted a white corbel that was previously in the breakfastroom with ORB, and hung a mirror that I had stained the frame above it. One of my favorite figurines looks perfect here. I got the wall pocket at Michael's on their 70% off rack for $5.09. Love it. A blue hydranga, feathers and magnolia flowers fill it out nicely. Nice arrangement for a change. I like it. My pretty little girl painting went into the hallway where the Grace picture previously was. That mirror is gorgeous and it looks perfect, with it's shape like the top of the gentle curve of the sofa. It also provides a great reflection of the other side of your room. Great choice Marty. The new arrangement looks wonderful! That large mirror so so pretty! Just perfect! Amazing when you change some accessories. I even like the leather chair in it's new location better. It was hidden in the corner. I thought at first you had bought a whole new couch. There is a richness in the big round mirror. It all looks great. Looks great Marty! I really like the mirror over the couch! Oh it looks wonderful there. I do love your little girl picture, she is so pretty. Have a wonderful day and thank you for sharing with us. Ok Marty you need to come and do some rearranging my way!! You did a super job and I love the clocks all displayed together! I sometimes get in a rut and just can't pull a new arrangement out of the bag! Isn't it fun to take things you already have and create a whole new look? I'll be you love having kitchen, breakfast room and family room as one giant space. The new arrangement looks so beautiful and serene.. I agree sometimes a wall is better when its just simple and elegant. Marty, I love your new wall arrangement in the living room and I like where you moved the picture to. Both walls look great. Nice changes...I like a mirror in a room...it is nice to see reflections in it. Pretty room. Marty I love popping over here and seeing what you do next. You really do have a great eye for wall hangings. I love the warmness of you home with all your lovely antiques. We have a thing for clocks too, in fact I have the same sessions clock you do. Have a great week Marty. Marty, you have such a great look going there above your sofa, and the added bonus is just great! What a warm and lovely room! Marty everything you do is always just right and this is no exception! 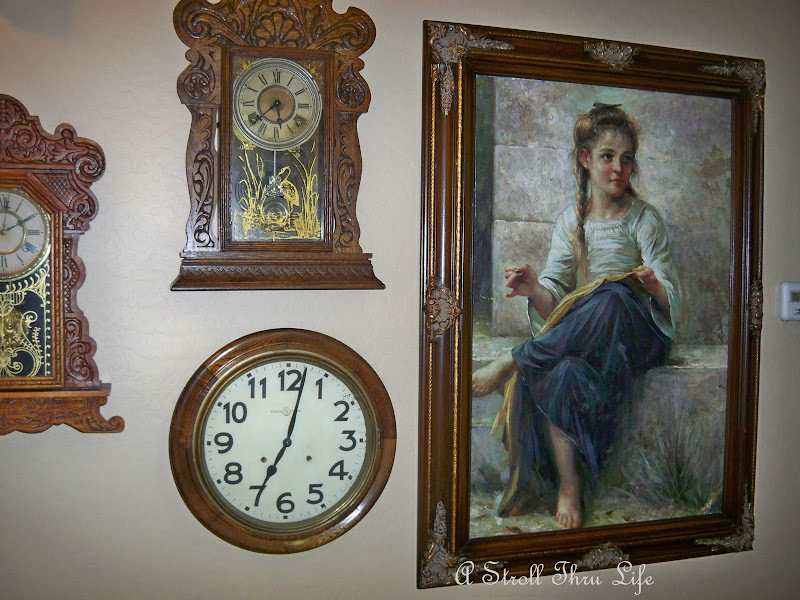 I love the clock collection too, such a clever idea and the painting of the girl is perfect there. I love mirrors and how they reflect light in a room. How fun that the round mirror also makes the entire space look different! Don't you love using what you already have to completely change a room?! 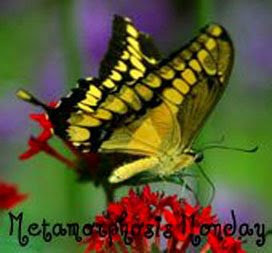 I really like your metamorphosis! Hope you are having a great Sunday! I love your new arrangement over the sofa! It really adds a nice touch with that beautiful mirror and the wall pocket! I had to chuckle at the real life comment! Most of us would be thrilled to death to have our space look that good! You have the touch girlfriend! It is just lovely. Thanks for sharing it with us. Ohhh...I love ALL the changes that you've been making lately, my friend! 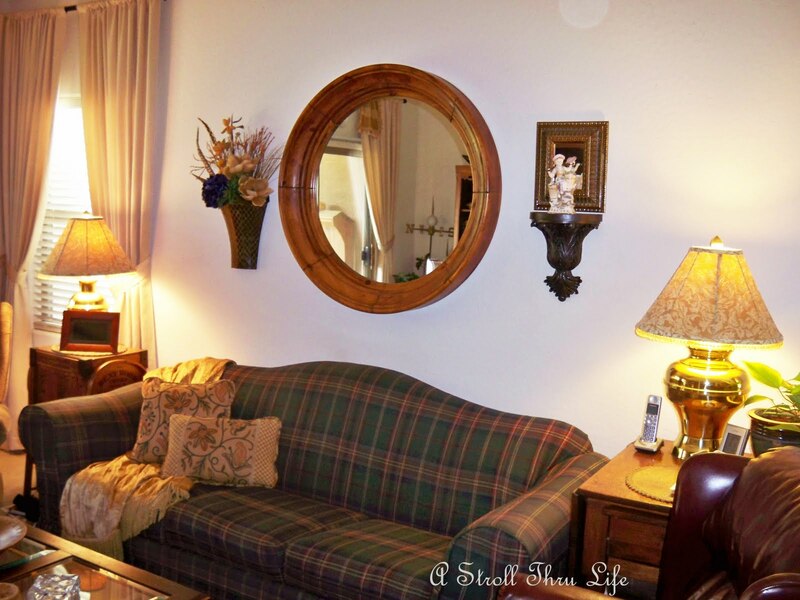 I think your large, round mirror looks gorgeous above your sofa and I love the corbels and new decor!!! I just giggled...it really is a domino effect when you change even one thing! It happens here at my place all the time! But then, that's what we enjoy!!! Marty, you have such a beautiful home! I always enjoy my visits! Thank you for sharing it with us!!! I am in LOVE with that mirror! So beautiful! Well done darling - the space just looks great! And I love how you have the wall pocket flanking the little corbel! I have one of those pockets and I am always at a loss what to do with it! This is such a great idea! Love it Marty! 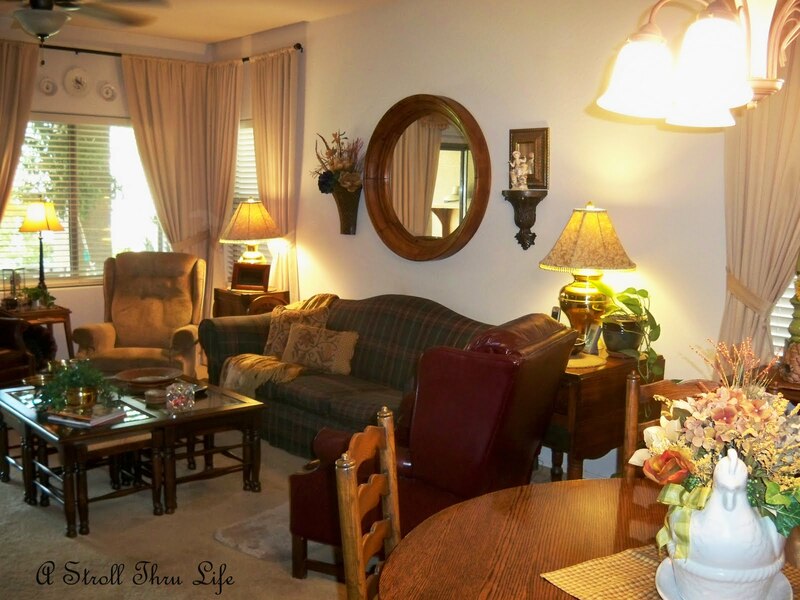 All your changes make your home love even better! I have a difficult time changing things once I get it the way I like it, but you do such a great job changing it up that I am inspired!!! 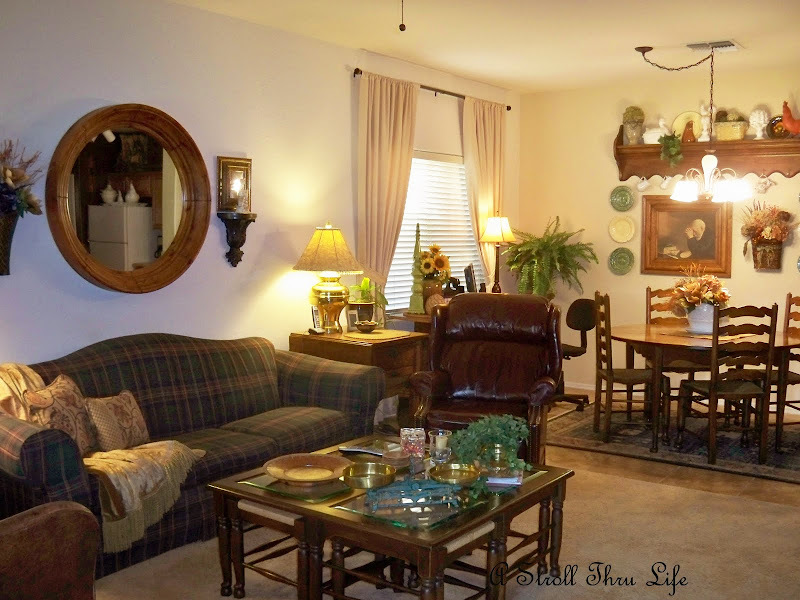 I love the changes that you've made in both your kitchen and your family room. Doesn't it feel good to change things around every now and then? Everything looks so pretty Marty! What a great switcheroo;)! Your new look is great! I love love that mirror! and your wall of clocks is just so neat! I wish I was able to do that in my house! I love the new wall. I always love how mirrors add such dimension to a room, and what a bonus, to be able to see the tv from the kitchen now! 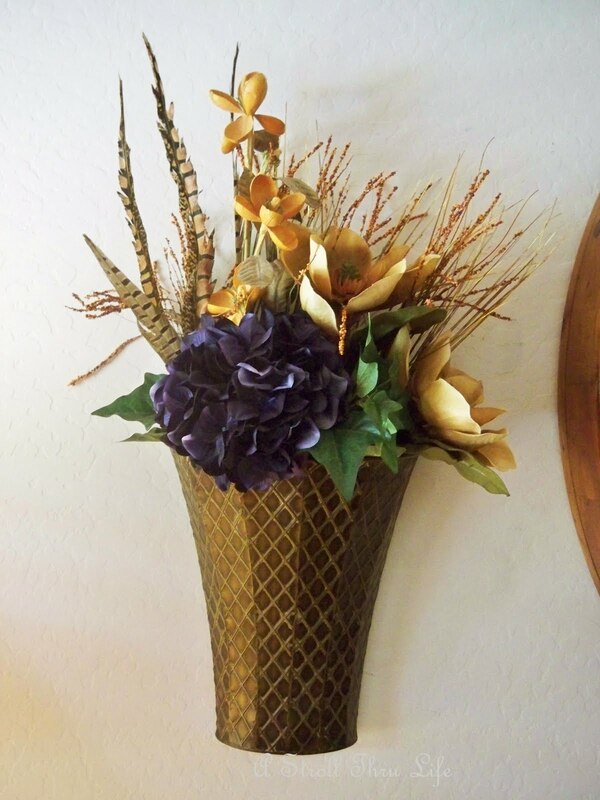 Your new arrangement looks just perfect! 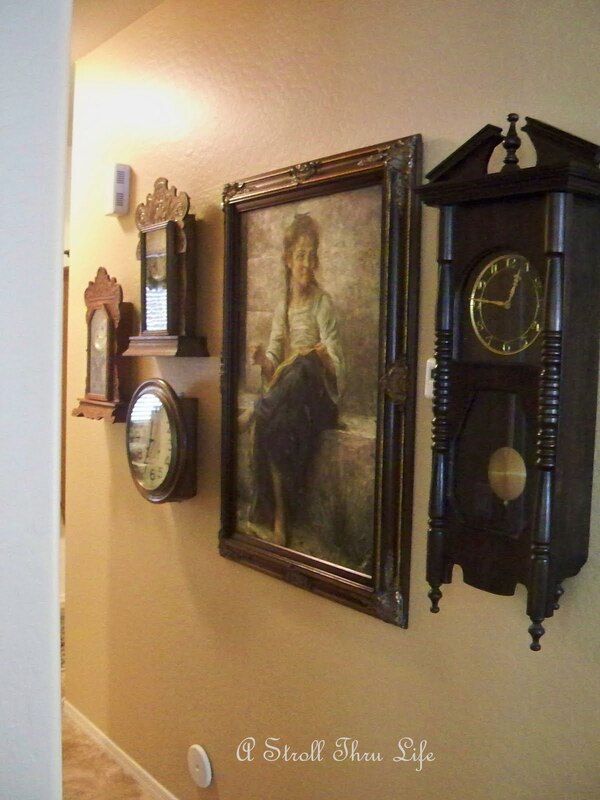 I especially like the hallway grouping of clocks with girl painting. That works really well! Why is it that I picture you just running around your house all the time shifting things from place to place? wow that looks great Marty!! Much warmer! Magnificent. Loved it before, love it after. You did a wonderful job. Looks BEAUTIFUL!! Thanks for sharing. I love the changes even though I thought it was pretty before AND after! Your way with wall display is very restful to me. I think it must be nice to sit in those rooms and just enjoy the roaming eye. And my favorite thing is the wall pocket. My mother would love it. She collects antique ones. She's all about her wall pockets! Happy Monday Marty, I always love seeing how you arrange our nest-simply so warm, inviting and beautiful. Thank you for sharing. Have an enjoyable day in sunny Arizona. Love the change! You home is so very cozy! Marty, your home is just so beautiful, warm and inviting! The changes you made are just wonderful! I love your treasured clocks on your wall around that painting, that is such an awesome look! You always have the best ideas and your decorating style is just the best! Your changes look very nice Marty. I think the you were smart to place the round mirror above the sofa and your pretty little girl looks very happy in the hallway. ooooo---lucky find! How awesome is that mirror over your sofa?!? Lovely! All the newly arranged walls look really pretty! I have that wall pocket from Michael's, but didn't get it at 70% off!! :-( It was on sale though. Love the little girl picture! You have such an eye for Interior Design. Lovely. Marty, I truly prefer the element of drama that the mirror adds over the sofa. It's just great. I so admire your continuing decor tweaks. Good news! We're staring a Friday Giveaway link-up party this Fri. 8/27 plus we are giving away custom backsplash! Please join us. Jane F.